Two black holes are challenging the prevailing idea of how giant black holes grow in the cores of galaxies. These black holes are found in the centers of two relatively nearby galaxies: NGC 4342 and NGC 4291. New Chandra data suggest that the growth of these black holes is tied to the envelopes of dark matter around the galaxies, not their bulges. New results based on the two objects shown here are challenging the prevailing ideas as to how supermassive black holes grow in the centers of galaxies. NGC 4342 and NGC 4291, the two galaxies in the study, are nearby in cosmic terms at distances of 75 million and 85 million light years respectively. 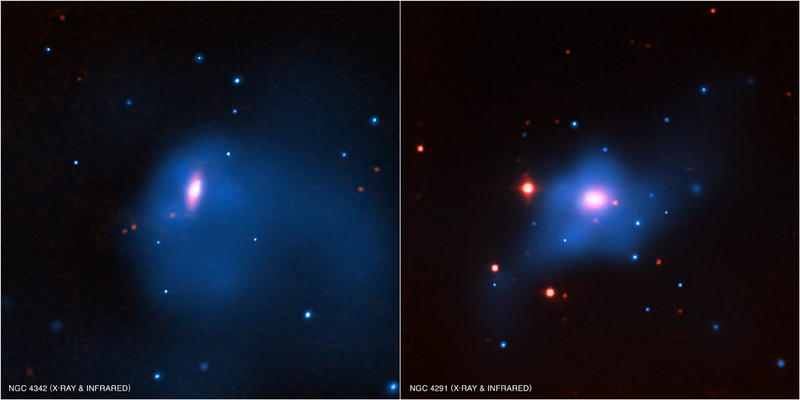 In these composite images, X-rays from NASA's Chandra X-ray Observatory are colored blue, while infrared data from the 2MASS project are seen in red. Astronomers had known from previous observations that these galaxies host black holes with unusually large masses compared to the mass contained in the central bulge of stars. 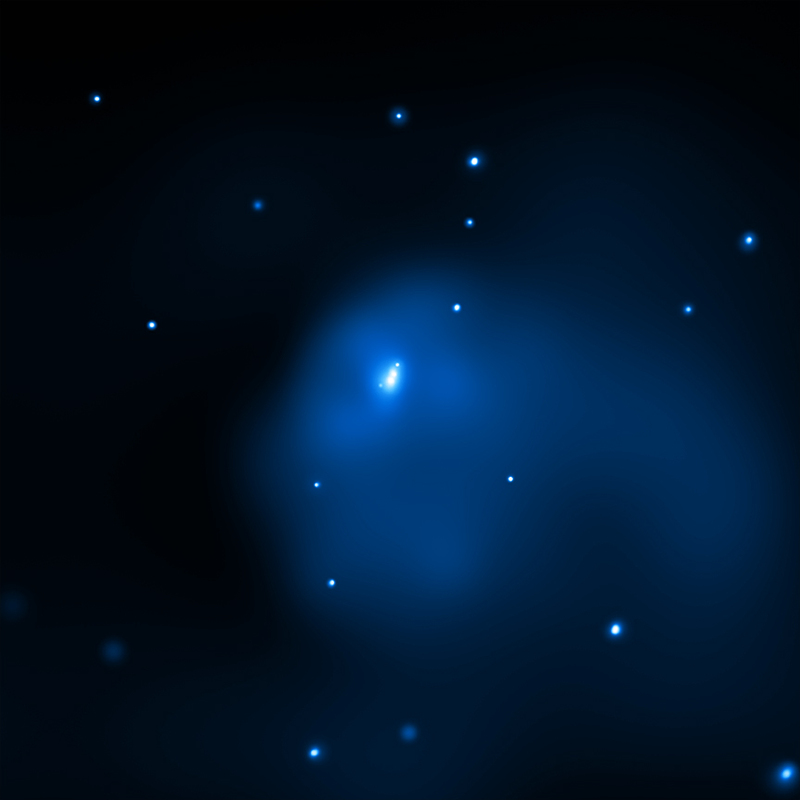 To study the dark matter envelopes contained in each galaxy, Chandra was used to examine their hot gas content, which was found to be widespread in both objects. By analyzing the distribution of the hot gas, researchers were able to test whether the galaxies had "lost weight" through stars being pulled away during a tidal encounter with another galaxy. Estimates of the pressure of the hot gas, which must balance the gravitational pull of all the matter in the galaxy, showed that massive envelopes of dark matter must exist around each galaxy. Since this tidal stripping would have severely depleted the dark matter, which is more loosely tied to the galaxies than the stars, this process is unlikely to have occurred in either galaxy. The new results using NGC 4342 and NGC 4291 challenge the long-held idea that black holes at the centers of galaxies always grow in tandem with the bulges of stars that surround them. Rather this study suggests that the two supermassive black holes and their evolution are tied more closely to the amount and distribution of dark matter in each galaxy. In this picture the weights of the black hole and the dark matter envelope in these two galaxies are "normal" and the galaxies are underweight because they formed unusually slowly. Coordinates (J2000) RA 12h 23m 39.02s | Dec +07° 03´ 14.17"
Coordinates (J2000) RA 12h 20m 17.70s | Dec +75° 22´ 15.47"
How can the mass of a black hole grow faster than the stellar mass of its host galaxy? The study's authors suggest that a large concentration of gas spinning slowly in the galactic center is what the black hole consumes very early in its history. It grows quickly, and as it grows, the amount of gas it can accrete, or swallow, increases along with the energy output from the accretion. Once the black hole reaches a critical mass, outbursts powered by the continued consumption of gas prevent cooling and limits the production of new stars. Some theories suggest a link between dark matter and dark energy, but most do not, as they are thought to have very different properties. Dark matter is thought to be a kind of elementary particle or particles which are invisible but interact through gravity, so they tend to hold massive objects like galaxies and clusters of galaxies together. Dark energy is more likely to be a property of space itself and has repulsive properties. So if a black holes growth is not based off the stars or matter it swallows,why would dark matter cause it's growth? Could dark matter be a force that gives force to dark energy as it pop it and out of "empty" space, and if so would and could dark matter be tied in with the flow of time itself? I think the question might be is how much time do we have before the reaches ultimate super mass and strips the earth's atmosphere. An equation of epic proportion. Is the physics of the math correct?